Click Here to find Lensley + Get Your Own. Lensley Automatic is now available to lease. Service includes: installation, maintenance and software/hardware updates for your Lensley, customization updates as needed, online photo gallery hosting, guest photo delivery, guest email list download, and usage statistics. Shoot us an email via hello@lensley.com or give us a call at (800) 867-2090 for more information. For the past seven years, Lensley has designed and built custom photography experiences for the likes of Anheuser-Busch, Toyota, Nike and, a host of others. 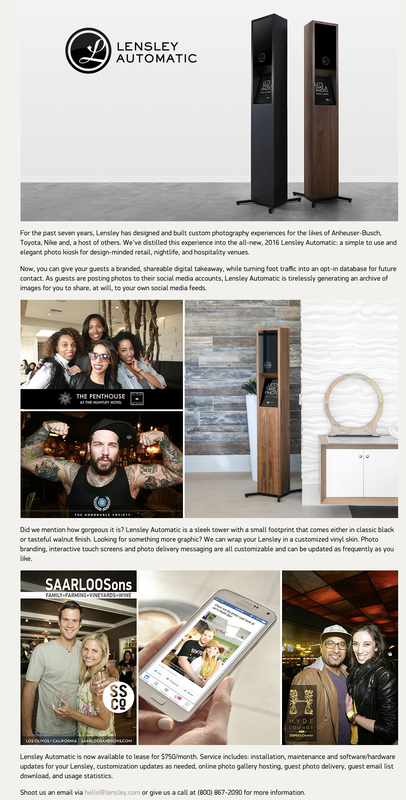 We’ve distilled this experience into the all-new, 2016 Lensley Automatic: a simple to use and elegant photo kiosk for design-minded retail, nightlife, and hospitality venues. Now, you can give your guests a branded, shareable digital takeaway, while turning foot traffic into an opt-in database for future contact. As guests are posting photos to their social media accounts, Lensley Automatic is tirelessly generating an archive of images for you to share, at will, to your own social media feeds. Did we mention how gorgeous it is? Lensley Automatic is a sleek tower with a small footprint that comes either in classic black or tasteful walnut finish. Looking for something more graphic? We can wrap your Lensley in a customized vinyl skin. Photo branding, interactive touch screens and photo delivery messaging are all customizable and can be updated as frequently as you like.